Halifax head coach Richard Marshall said he would find out a great deal about his players after they fell to a third straight defeat yesterday. 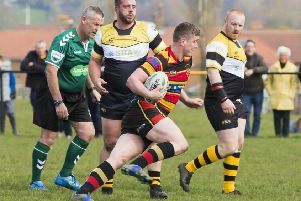 Marshall saw his side leading by six points going into the final quarter away to Sheffield yesterday before two late tries from the Eagles, including a hat trick score from Rob Worrincy, condemned them to a 28-24 defeat. Worrincy’s final try put the South Yorkshire outfit ahead for the only time in the afternoon. “Sheffield were desperate for the win today, maybe a little bit more than us,” said Marshall. “They dominated field position, especially in the second half, but we didn’t give up. The men from West Yorkshire led 18-6 at one stage in the first half, but Marshall says his side should have been more clinical in the opening stanza. “We should have done a little bit better in the first half. Influential half back Ben Johnston, Ross Divorty and Gareth Potts all struggled with injury at The Keepmoat in Doncaster, with the latter playing the full 80 minutes despite a shoulder complaint. “We were really up against it at times,” added Marshall. Sheffield and ‘Fax are ‘ranked’ as the bottom two sides in the qualifiers after finishing third and fourth respectively in the Championship. Marshall was keen to stress that his side’s season didn’t hinge on this result. “We have achieved a lot this year before these qualifier matches. “A measure will be how we respond to losing three in a row,” said Marshall, whose side face Salford in front of the Sky cameras in their next match.